The media increasingly appears to define the state of the economy based on corporate bottom lines and the experience of the upper echelon, reflected in the way it glosses over the anxiety and distress outside the top 1% of the population. The fact that this disconnect isn’t a figment of our imagination was confirmed by a recent study by Edmund Saez that reported that 121% of the income gains from 2009 to 2011 went to the top 1%, meaning they pulled further ahead while everyone else (in aggregate) became worse off. The big cause is the state of the labor market. And that isn’t just a product of the global crisis but also of a long-term restructuring of the relationship between employers and employees. One of the pet ideas of neoliberalism is to encourage “labor market flexibility” which is code for letting companies fire employees on a whim. The problem is that a quick to hire, quick to fire posture is not a terribly sound idea. It takes a lot of time and effort to hire and train people (yes, Virginia, even a skilled employee needs to learn the quirks of how his employer likes things done), so firing people casually means a loss of this investment. Export powerhouse Germany has not been competitively impaired by its restrictions on terminating employees. But while some businesses actually believe the HR trope that “employees are our most important asset”, most, to adopt an image from Robert Oak at the Economic Populist, treat them as disposables. McKinsey took note of this development in the early 2000s, when a study they commissioned from Yankelovich determined that new college graduates could expect to have 11 jobs by the age of 38. How can you plan any spending, much the less sensibly commit to buying a house or raising a family, with that much income uncertainty? Multiply that across most of the economy and no wonder this “expansion” is so sluggish. A recent report by Mark Szeltner, Carl Van Horn, and Cliff Zukin of the Heldrich Center at Rutgers, Diminished Lives and Futures: A Portrait of America in the Great-Recession Era, shows how far this trend has gone in the downturn. The media reports tended to play up this chart, which gives a sense of how pervasive job loss is, without hammering on the data: 23% of the respondents in their survey had lost a job. Of 18 to 34 year olds, it was 28%. And that’s before you consider the high level of unemployment among college graduates, as in how many have trouble getting hired after they graduate. And remember, traditionally, new graduates are seen as prime targets for hiring, since they are comparatively cheap and high energy. But they are apparently no longer such a great bargain now that everyone is scrambling for work. 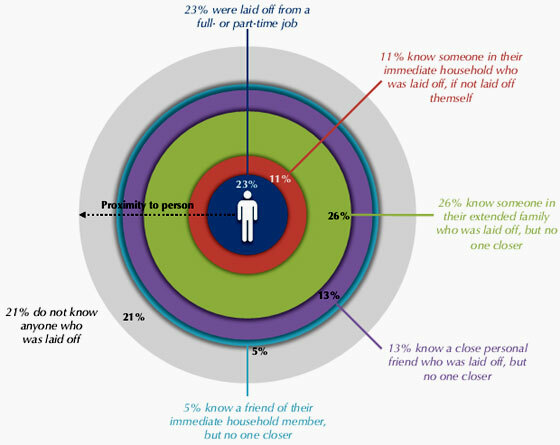 In addition, 20% of the survey respondents who did have a job were working part time, and the survey did not ascertain how many of them were underemployed. As unemployment statistics suggest, it is also hard to get a job once you’ve lost one. Of those who were terminated, only 35% found new work in six months. 22% said they could not get hired. And even the ones who did find employment typically had to settle for less to get a paycheck again. 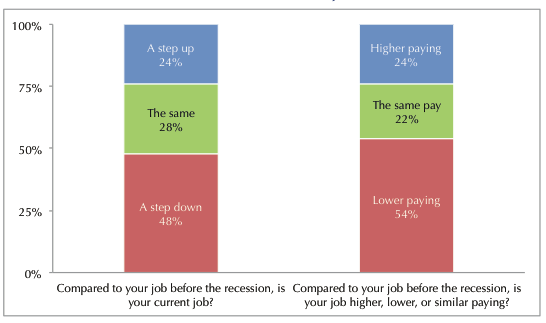 The chart below shows that almost half described their current job as a step down from the one they held before their recession-related layoff. And even more took a reduction in pay. The one-two punch of no income while looking for a job and (in the overwhelming majority of cases) landing a worse to more or less the same status/pay level of employment has serious financial consequences. Look at that chart closely. 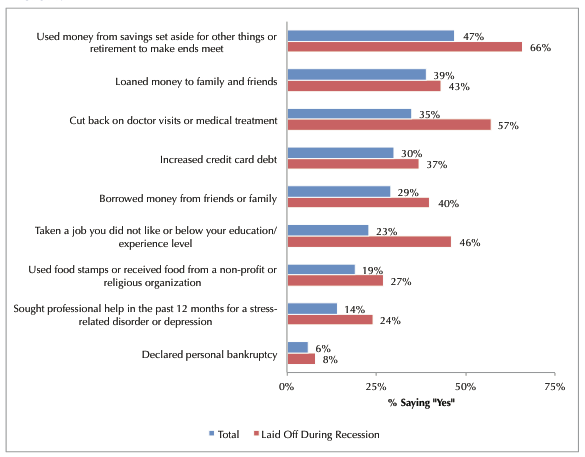 People are draining their retirement accounts, neglecting medical care, and relying on food stamps to get by. Yet we read much more about how the economy (read the bottom lines of public companies) is getting better, while the desperate state of the un and underemployed shows up in anecdotes decorating the occasional story on those topics alone, and is underplayed when the media ventures out to see how the remnants of the middle class are doing. Significant majorities expected that it would either take a long time for a return to normalcy or that the old way would never come back on a host of issues: college affordability, seniors not needing to work to supplement income, employees feeling secure in their jobs, lower unemployment, ability to find work commensurate with one’s skill levels. While this report has gotten media coverage, most mainstream sources have tended to focus on one aspect, perhaps because the totality is too much of a downer. I strongly encourage you read the entire report, since it will provides some badly-needed insight into conditions on the unemployment line. This entry was posted in Economic fundamentals, Income disparity, The destruction of the middle class on February 18, 2013 by Yves Smith. Something I’ve been trying to wrap my head around is, is there actually merit to the “labor market flexibility” argument? Does Germany do well because of the worker protections or in spite of them? I work in the mobile industry in Scandinavia as a contract worker and my life epitomizes the stress and insecurity that comes with feeling forced into this lifestyle, but do see how it’s advantageous to my employer to have me on board compared to how difficult it is for them to shed the dead weight of lazy permanent employees protected by particularly strong unions and worker rights laws here. I have been wondering if the failure of Nordic and Japanese countries in this industry is partially due to strong employment guarantees or if I have been brainwashed and that is a vast oversimplification. For me, contractors and short-term hires are just as likely to be lazy as long-serving permanent employees. Some are naive enough to maybe buy the line that if they turn out to be really, really good, they might get taken on as permanent. But anyone who has been in that environment long enough soon realises that the chances of that promise being kept are slim to none. So if they’re a hard worker, they’re a hard worker. If they are going to do as little as they can get away with, they’ll do as little as they can get away with. For contractors looking to feather their nests as much as they can, there’s two risks I’ve seen from this type of worker. One if that they try and play whatever political games are underway at the organisation they are working at. They can then end up diverting substantial amounts of their efforts to trying to ingratiate themselves with “the right people” on “the winning side”. Rather than concentrate on the task at hand. The other risk is that they attempt to gain favour by not following operational procedures, taking risks, looking for quick-wins at the expense of quality or reliability. I’ve seen first hand projects which hire leaders specifically to pay only lip-service to regulatory requirements with both the company and the resource colluding to make this happen (both parties “safe” in the knowledge that the culprit will disappear from the scene soon enough). The whole dynamic at work here reminds me of that documentary “Hookers Hustlers Pimps and Their Johns”. Nothing it contained was an example of how to form and foster healthy long term relationships between the various parties. Adam Curtis, in The Trap, makes a pretty solid case for the argument that the “F_uck You, Buddy” attitude was evangelized by Tory and Labor alike. With the moral and intellectual sanction that came down from on high — from both the academy and the halls of power — it is like a cancer that has spread to every nook and cranny of labor relations these days, in both the public and private sectors. The self-interest axiom that underpins capitalist theory has been given free rein, and it has run amok. It is nihilism. No one can live happily who has regard to himself alone and transforms everything into a question of his own utility: you must live for your neighbour, if you would live for yourself. Thanks Mex. I was lucky enough to see “The Trap” when it first aired on BBC. I watched each hour utterly spellbound. There, for the fist time, someone had encapsulated my existence, everything I was thinking and feeling but couldn’t quite express, couldn’t really dredge up from the subconscious to the conscious thought level. NC doesn’t have an “entrance exam” but if Yves ever introduced such a thing, watching the entire series would pretty much be it. “Seminal” is such an overused word. But this was truly seminal work on the part of Adam Curtis. I think we’ll look back in 10 years time and see that it set in motion a series of small waves which eventually came to wash over the entire world, turning into tsunamis when needed to sweep away all that needed to be swept away. One of the most common impediments to contractors “becoming permanent” is that the predominant business model of contracting companies includes contractual prohibitions against employees leaving to work for their customers, and customers from hiring their contract employees. The best use of contractors is for short term subject matter expertise or services that are outside the core business of the hiring company. This allows for rapid use of needed skills until they are no longer needed without the costs of recruiting and separation. Using the contractor model for long term work can be counterproductive and costly. The customer has less control over the contractors’ practices than they would otherwise, and often must pay premiums for ‘change orders’ (a staple of contracting). As to workers, all are provided at a premium cost to cover the cost of external management and profit – this is true for the productive and nonproductive. In a long term relationship, expert contracting companies excell in finding the most valuable employee resources and working them into the critical path of the customer so that they can charge much greater premiums for them. Sometimes this balance can go wrong, leaving the most productive workers priced out of the customer’s ability to pay, and preventing the employee from permanently joining the customer. There can further complications from legal precedents of long term contract employees successfully suing for employee benefits of the customer organization. Another item to consider for using German restrictions on termination is the mercantilist nature of the German economy in relation to the EU. When you have the advantage of lending money to other nations so that they can buy your goods, you have a host of follow on advantages, such as lower costs of doing business, lower wages, and access to capital. Additionally, from what I understand about German employment, they have traded higher wages for steady employment and state paid benefits. The danger is that your debtors may default on their debts, and then not buy the goods which you are exporting. Which is not happening at all in europe. Nothing to see there, move along. We could also take this to the extreme that Spain and Italy do. Inability to terminate employment hasn’t lead to 50%+ youth unemployment, the pernicious nature of short term contracting, inability to plan any steady future, investment, or uncertainty hedge. Not at all. We can observe the nature of the ACA here at home, its definition of Full Time work at 30 hours (! ), and the effects within lower margin industries such as retail, food service, and small business’ with 50+ employees or close to the line. Stories are slowly creeping into the public mind that “costs might rise”, and that premiums might have to rise by 50-100% by 2014. Employers are cutting full time positions into part time positions, increasing “employment”, but are doing so to avoid the penalties and cost of care that will rise every year in a nearly geometric (exponential? logarithmic?) fashion. Is that wrong? Does morality even come into play when discussing costs that will become prohibitive in a few short years, or already prohibitive? As a final question, what do all of these policies have in common? There is a probationary time to sort of the hard workers from the lazy ones. In Sweden you can have a two year probationary period and employers who can’t determine if a worker is good or not in two years are likely to be out of business within two years anyway. It is a common myth about difficulty to fire people in the Nordics. From what I’ve heard from employers it is not difficult to fire poor workers, however, it is very difficult to fire poor managers. Contract work should be for temporary peaks in workload, cover for maternity leave and sickness etc. & yes, ‘Atlas shrugged’ is among the books they sponsor and try, and sadly succeed, to get the young to read. It is a common myth about difficulty to fire people in the Nordics. This is pretty much what I’ve found to be the case with neoliberal theory and argumentation across the board. Whenever one takes the time to scratch beneath the surface, what one finds is that it’s all built upon distortions, half-truths and outright lies. My favorite one is that workers in the developed countries have to sacrifice so that workers in the developing world can have more. The reality, however, is that workers in both the developed and developing worlds sacrifice so that the economic overlords can have more. Yes, when blacklegs offer to do someone else’s job for less, they don’t even help themselves in the end. It’s only the asset owner who benefits. Like all things, I think there’s a balance between too much and too little “flexibility” (NB: I’m not implying Sweden has too little, as I don’t really know their system first-hand). Certainly companies need to make changes to their workforce as their products / markets evolve. But improving your workforce’s productivity takes a lot of time and effort, and it’s frequently cheaper and easier to re-train your existing staff than start over with new hires. Skills are not nearly as fungible as managers would like to believe. Someone who’s a C++ programmer, even with a similar number of years of work experience doing the exact same thing, won’t be nearly as productive as your own C++ programmer who built your product through the first several versions. Layoffs can be even worse: once rumors start floating about imminent layoffs, the first to jump ship are usually the most qualified / productive employees who know they can get a job somewhere else. The ones who finally remain are frequently not only the least productive, but are now demoralized and suspicious to boot. Is it any wonder then that mass layoffs to meet quarterly cost-cutting targets end up weakening companies? WRT to consulting: the real reason why companies love it is precisely because it relieves them of the responsibility to manage their employees. And they’re willing to pay a hefty premium (in profit to the consulting company) for that. You typically hire an outsourcer to accomplish some task for you. For all you care, after that, they can hire magic elves who sprinkle fairy dust every night to get things done. It’s no longer your responsibility. Regardless of the practical matter that you will end up spending as much time managing the consultants as you would have your own employees, the fact that they’re not *your* employees means when something goes wrong, you have someone and something else to blame besides your own lackluster management skills. Imagine you’re a manager tasked with customer support. Would you rather subcontract to an outsourcer whom you can then blame when *they* fail to meet quality / cost targets, or hire your own employees so that your bosses can them blame *you* when the same targets aren’t met? And how much of a premium are you willing to pay for that extra layer of scapegoating? As far as the most qualified/productive employees being the first to jump ship and the least productive sticking around, that is usually the case in a normal economy, but in this terrible one, even the best employees have no choice but to stay in a doomed situation until the hammer drops, e.g., Four years ago, I worked for a branch office of a company that told us at the end of the first quarter of the year that our office would be closed at the end of the year and all of us would lose our jobs. Most of us (included the most productive employees) remained till the end of the year due to an inability to find work; some people got lucky and went back to work for previous employers. I did find work near the middle of the next year, after close to six months of unemployment–and a position that my boss struggled over hiring me for because she thought I was over qualified. But as far as I was concerned, after spending close to half the previous year and much of that year applying for work (and having hit the half century mark), it was better than potentially being one of those 99 or 189 week unemployed persons. I suspect there are multiple issues. The first generation of mobile phones in the nordics used a local analog system, NMT. This allowed various companies to establish themselves with little outside competition. Then came GSM, a pan-european (and later global) digital system. Around the same time CDMA was introduced in Japan and USA, meaning that there was little competition from there until GSM spread into USA. But then the opening of borders happened with the collapse of the soviet union and China opening its borders to foreign industry. Also South Korea is steadily gaining traction as a nation to rival Japan on the electronics market. This opened up vast sources of cheap labor with weak labor laws (although China is on paper a workers nation). End result is that by the time UMTS was introduced, the nordic companies faced competition not only in terms of cost but also in terms of production capacity. Never mind that by this time the neoliberal idea of free cross border trade had firmly taken root, so the option to put up import tariffs was a political impossibility (even tho that China is clearly playing dirty by fixing the exchange rate of the yuan against the US dollar while the rest have to deal with free floating exchange rates). For instance, Nokia’s current problem is not the competition over the smartphone market, no matter how much the press loves to chatter on about it, but encroachment of Samsung and Huawei in south Asia and Africa. This is a place where Nokia have in the past been finding solid markets for their featurephones, allowing those sales to act as a foundation for their smartphones. You can see a similar behavior in the car market; where while the sport and semi-sport models are what gets the press going, it is the low end compacts and other mass market models that carry the companies year after year. This is a pattern we can find again and again, and i think the turn of phrase is “a race to the bottom”. And in my opinion, loosening the labor laws may look like a fix in the short term but will just exasperate the problem in the long term. “Labor market flexibility” in the theme of this article is a hire-and-fire mentality which, along with the collateral damage caused by job insecurity to the macro economy is probably rightly identified as the biggest risk to a business which unwisely decides to operate that model. Of course, it is a long-term risk which may yield some short-term (paper) cost savings. I would add “outsourcing”, “Labor market flexibility”‘s kissing cousin to the list too. Outsourcing is neoliberalism’s trick-card for the type of labor which might seem to have high substituteability. But the ability to quickly and easily substitute one worker for another fails to promise what it delivers at all parts of the labor spectrum. Clearly skilled engineering roles, teaching, medicine (especially specialised medicine) are subject to an inherently steep learning curve. However, postal deliveries — which at face-value is nothing more than putting post in the mailbox — is very beneficial to efficiencies gained through route knowledge (getting to know short-cuts, not wasting a long time waiting for and answer at a residence you know isn’t occupied during the day for a signed delivery, conversely waiting a little while when you know more often than not someone is in). In social care (retirement homes), getting to know the person you’re caring for saves time and improves resident satisfaction. A high turnover in retail service assistants has a direct link to stock shrinkage (both staff and customer thefts). And so on. Outsourcing by its very nature encourages labor to be disloyal to the ultimate employer. Even if an individual resource likes working for Company A or Company B, the outsourcer will have no regards to that and move the person around as it suits the outsourcer. Moreover, if the individual is good, the may well be moved around more because the outsourcer is tempted to utilise them in situations where they need to create a good impression or solve an issue of historic poor delivery for a particular business. By outsourcing, the “employer” loses control of and responsibility for their workforce. As Yves’ piece points out, that’s a feature for may companies, not a bug. But with outsourcers in the supplier chain, even if the company wants to reign in the worse excesses of a “we don’t give a damn about labor” mentality, it might find that in attempting to change course, it is no longer at the wheel. Bosses have since had the upper hand and have no plans to relinquish control. No more panic attacks for bosses. There are still some good ones with the foresight to look beyond the current quarter’s bottom line, but I would guess that most will continue to outsource work, use independent contractors and fire workers at will — rather than keep and nurture productive employees, even if it means losing time and money tenfold. I would also guess that bosses who let their pride dictate their business decisions won’t be around for long. So far I’m wrong. They’re still here, and the majority are still getting shafted. Fifteen years ago where you worked but not 15 years ago where I worked. I worked in printing and publishing thru the 70s, 80s, and 90s. Most of us were eminently disposable. Same at every GE plant after Welsh took over. It is high time people gave up the fantasy of ‘having a job’. From ages 15-22, instead of regurgitating school lessons, yearning for popularity, aping fasion, partying and exhausting themselves on ball fields, young people should develop a variety of skills that will make them useful to themselves and productive without needing an employer to support them. Too many people believe that just showing up and doing with a smile what one is told to do creates an entitlement. Those days are over. Personally, I wasted ten years trying to get a good job, never found one worth having, and was forty years old and broke before I figured out that the job market was an oxymoron. Once I resolved to stop looking and figure out a way to survive, I discovered how little a person really needs. Yeah, I know all about family responsibilities, but you need to put the horse before the cart, rather than the reverse. Jake, After 29 years at IBM and counting, I can’t count on pension, stock, any of that stuff. It could all be washed away. Sure owning my house is nice. I have a friend living in a tent in the South. He’s doing fine. And he doesn’t dumpster dive. We throw away half our food, of course. I’m a big Buy American fan. When the products are at least Assembled here. The medical thing is a big deal, but only because I have savings, therefore I have to protect them by buying insurance. Working for the man is highly overrated. The Saez data show that for the 99% the recession never ended. The recovery never began. In other words, a recovery for the 1% is no recovery at all. This post is important because it gives evidence, as Yves points out, that for significant groups of workers job quality is worsening, and more than this, it is a feature, not a bug. I agree too about code words and phrases. Labor market flexibility, outsourcing, right to work, job creators, automation, structural unemployment, job/skills mismatches, the established discourse of economics is filled with lies and canards, and this too is a feature, not a bug. But I wished in particular to address one canard raised in the first comment to this thread: the lazy worker. Has anyone ever worked in an organization that did not have some who were “lazier” or less competent than others? But riddle me this who did management let go? These or others who were neither lazy nor incompetent? And what even do we mean by lazy? I for one pride myself on being lazy. For me, this means working out the most effective means of doing something and then doing it that way. This is sometimes called efficiency. But then this brings into question what we mean by efficiency in a business enterprise. I can not remember being part of or having read about a single enterprise I would call efficient, and you know I don’t think that’s a bad thing. At the same time, managers just do, usually fairly ineptly, what they are told by their managers to do. This often means they demand their workers to do things that are grossly inefficient but are quote unquote the company way. My point here is that we all need to question our terms. What does it mean to say someone is really effective if what they are doing is stupid? Are they really being productive or efficient? Does efficiency apply to stupidity? And if the lazy are still with us and always will be with us, then whatever management is doing has other motivations. I would also like to point out in this vein that the ultimate purpose of corporations is to maximize profits. This is false. Corporations are social constructs. They are tolerated by society, that is us, if they fill a social purpose. In our modern day kleptocracy, they not only do not fill a social purpose, they and profit maximization do great social harm. This brings me back to efficiency. Who cares if a corporation is “efficient” if it aids a social purpose? And who cares how “efficient” a corporation is if loots those to whom it sells and those upon whose labor it depends? Corporations must serve society before those of its “investors” and managers. In a kleptocracy, naturally, this relationship is reversed. For example, in addition to my writing my scintillating contributions here, I am attempting to practice some much needed “masterly inactivity” on two situations which require just that. This, in the face of all manner of ineffectual flapping around by people who cannot possibly make any sort of progress until an executive decision is made (which, being an executive decision, is not forthcoming — basically, there’s two situation, one of which requires an asset write down because what the asses is worth is not remotely what’s in the book value, the other is a desperate attempt to hanker after a level of return and profitability which was possible in the Bubble Era but the people concerned cannot get their heads around the fact that not only has the dumb money been wiped out, there’s not that much of the smart money still at the table). And think of all those companies ‘efficiently’ destroying the environment, and polluting our food supply and contaminating aquifers. I work in a very fast paced environment, but I am not one predisposed to rapid movement. So I have cultivated a great efficiency of motion to survive my workday. From an untrained perspective I might look quite lazy next to my co-workers who are frantically running around. “Efficient”, “lazy”, “productive” these are all words with no meaning without context. They get rid of anyone who can evaluate them. Consequently, the more downwardly mobile you are, the more tenuous your situation becomes. Thus, it’s important to rise to the level of your own incompetence, where you’ll be in good company. Either you or perhaps Diptherio made an excellent point on another thread – which I may have blissfully misunderstood – about going outwards from first principal (social benefit) rather than going upwards from specific methodology – or something to that effect towards the realization of first principal. What I’m saying is that the purpose of business should be to serve the public, currently it’s the other way around, and that first principal should include and define it’s relationship with and treatment of employees. If one starts out with the overall well being of society in mind, then such things as the relative benefits of short term vs. full-time employees falls into place without so much need for mental gymnastics and flummox or ideological arm twisting regarding such things as laziness or the right to work or even the right to sustenance by virtue of simply being here. For instance, though I’m inclined by upbringing to believe in the work, work, work work, ethic, I see no absolute virtue in it, and certainly not in the jingoistic exploitative exaltation of it, especially in a society that in theory at least can automate most of the production of most necessities. That seems pertinent to this discussion as Hyperpolarizer points out below from a slightly different perspective . I tend to be of the view that hire and fire underestimates the importance of learning on the job, but blaming companies entirely for this problem is also wrong. It is if you like a vicious circle. Nobody ends up investing in training, if valuable skills can just walk out the door. And because nobody is investing in training, everybody complains about a skills shortage. I have an idea that this problem developed from both sides, with new starts poaching employees, and employees being only too willing to look for money. In Germany, firms must invest a certain amount on staff training or face a tax penalty. This at least stops the free rider problem. At one stage I thought maybe outsourcing would solve the problem, as outsource body shops became quasi privatised unions. But offshoring put an end to that possibility. I really think the only way to combat is through delayed training bonuses – that are forfeited if workers leave their companies before a certain time. What will tend to act against this though, is management culture. Management no longer feels constrained by promises made by (different) management in the past (one reason that managers of often recruited from outside). So such a bonus is promise waiting to be broken. One way around this is to externally bond it. It the worker is sacked, it is his by right. Alternatively, like in football (soccer) players could sign binding contracts for several years which have to be bought out if either side wants to break the contract (i.e. recruiting firms would have to play a transfer fee). Many companies and their HR staff are taken by surprise that the ’employee at will’ relationship can go both ways. Promulgating an understanding that a company can let their employees go “for any reason, or no reason” if it is in the best business interest of the company, has the effect of seriously eroding employee loyalty to the company (why wouldn’t it). I have noticed that the stigma of leaving an employer “without proper notice” is all but gone. It is also ironic that companies are similarly surprised when employees leave before the standard notice policies stated in the company policy manual that usually includes a page (signed by the employee) saying roughly “I understand that this policy manual IS NOT A CONTRACT, and in NO WAY BINDS OR OBLIGATES the company IN ANY WAY”… Not a very romantic start of a relationship. Well, actually it does not go both ways because of noncompete agreements. Klassy!, FYI their is NO SUCH THING as a legally binding “Noncompete” clause. Courts have repeatedly struck down attempts by employers to stifle ones ability to make a living. Yes, I know that but consulting companies have their ways of making them stick. Ask my husband. There are ways to limit the options of another party, by means other than a contract, particularly one enforceable on both parties. But involving courts and treating parties as equals, is disadvantageous. As one such skilled worker, on the Anglo-American plantation, I have seen this process up close for several decades now. Your suggestions are creative, in a Continental European way, where a contract might still exist between management and labor. In the Anglo-American system there never has been a social contract, that wasn’t hard fought against by conservatives and subsequently pushed back by the reactionaries … though conservatives and reactionaries haven’t won every battle. The Anglo-American system is based on the armed privateering of the West Indies Company and the East Indies company funded by The City in London (and its affiliates). The corporations cry crocodile tears about the skill shortage … what they really mean is that they can’t get enough Chinese factory workers to work for free, or enough Indian office workers to work for free. This neo-colonial option wasn’t available until recent decades. Similarly the W Europeans exploit E European and N African labor. Internal colonization is occurring in N America and W Europe also, we really haven’t changed much from the 1750s. Valuable skills walking out the door is moderated in the Anglo-American system thru chattal slavery, wage slavery and debt slavery in that historical progression … all of those systems of constraint between unequal parties. I am just a better educated better paid version, of the 18th century Sinhalese working the tea plantation for his British masters. Add to all this, the agreements between corporations to not compete against each other for employees. Not very different from saying “You aren’t a slave…you can leave any time you like (but good luck getting hired by somebody in my old boy network). Debt slavery systems are particularly unsustainable. Usually a new king or leader abolishes the debts with a jubilee, a generous bankruptcy law, or something similar. If they don’t, the money economy goes away. The last time which I know of when a debt slavery system collapsed “on its own” was during the fall of the Roman Empire. It was replaced by feudalism, an economic system which avoided money entirely for most transactions. If employers want to keep their workers, they can begin by respecting them, providing them with a good working environment, and paying them what they are worth. It shows how far down the rabbit hole we have gone that common sense and common decency have become such radical concepts. A homeless man warms himself by a fire. Each year, more than 3 million people experience homelessness, including 1.3 million children. And according to national studies, even more Americans are at risk of homelessness. Millions of low-income American households pay more that 50 percent of their income on rent when estimates say the figure should be no more than 30 percent. A missed paycheck, a health emergency, or an unpaid bill creates a crisis, pushing them out of their homes and in to homelessness. Beginning in the early 1980s, the number of homeless Americans grew dramatically. The face of homelessness became diverse. It came to include mothers and fathers, sons and daughters, and racial and ethnic minorities. One-third of the homeless population is made up of families. Almost half of the homeless population works, but does not earn enough to pay for housing. Incomes for the poorest Americans have not kept pace with rising housing costs. Millions of workers are shut out of the private housing market. Cleanup @ February 18, 2013 at 5:41 am… cat attack! You note the upsurge in homelessness in the mid 1980’s; please remember that it was entirely the product of Reagan administration policies. There is a whole generation in America that accepts mass homelessness as a norm; but many of us remember a time before that, when the much smaller homeless population comprised hobos, people with severe substance abuse problems, and the mentally ill.
Argh… wrong comment got cleaned up, anywho repost. As earned income for the poor is decreasing, assistance programs have been severely cut. Opinion polls show that the majority of Americans support solutions to end homelessness. But, to achieve this goal, vigorous advocacy is needed. The wrong comment was deleted upon clean up request, links and such are gone. The original would have made clear the neoliberal underpinnings of your observation and the neoliberal market solution: monitored – gated car parks for the half homeless to stay in at nigh, by day they wander looking for employment or a good community park (whilst they last). Some letters Herbert Spencer had written to the English weekly The Nonconformist were republished as a pamphlet, THE PROPER SPHERE OF GOVERNMENT. Government does more harm than good the moment it goes beyond the simple upholding of natural rights. It is wicked to attempt to prevent the poor from perishing. Wicked, wicked, wicked. It is cruel. Cruel, cruel, cruel. Do not interfere with God’s will, but be an English gentleman, and stand aside and watch! Get this, God wants you to enjoy your cigar. Skippy… This is the plan… let Gawd sort it out. He is the poster boy of modern neoliberal economics, everything else – is – just slick messaging. They mean to – off – these people in a job drought, so they don’t have to pony up with maintenance or legacy costs, its a bottom line issue… a personal bottom line… and the rapturous nature – rules of the neoliberal – survival of the fittest – game… precludes altruistic acts. Perhaps this is what Blankfein had in mind when he spoke of doing God’s work. Canada’s usually follows about a decade behind the USA in neoliberal trends. When I first came to Vancouver in 1987, homelessness and dumpster-diving were extremely rare. Homelessness existed, but you had to go look for it. By about 1993 it became noticeable, but it was still unusual. By 1997 it was pervasive. By 2003 homeless people had become an ordinary sight even in the outer suburbs (e.g. Langley). By 2008 it was getting so bad (i.e. people literally dying in the streets) that the Vancouver municipal government, in order to avoid embarrassment during the 2010 Winter Olympics, made available some additional emergency shelters. Bear in mind, too, that Canada’s recession in 2008 was very mild. Meanwhile, housing quality is becoming a problem. The older rental housing stock in the Vancouver area is deteriorating. Classic slum lords are making their appearance, and they seem to enjoy the connivance of municipal inspectors. Illegal renovations to increase occupancy are almost as rampant as the city’s bedbug infestation. The even sadder thing is that even as college graduates are having a difficult time finding jobs you’ll hear the trope that if you want a better job that doesn’t pay peanuts then you should’ve gone to college. Uh, many of those in the “disposable” set of workers did just that. They went to college and then got stuck with debt and a minimum wage job. I have 2 bachelors of science (from the UK) and 2 masters of science degrees (one UK one US). I am 42 and I cannot get a job. Not “I cannot get a decent job” – I CANNOT GET ANY JOB… “overqualified” “under-qualified” whatever…apparently all the westsiders in LA are genii that come complete with fantasy jobs, million dollar mortgages and M-series cars. So why is it that when I meet them, it turns out they are mainly rather foolish and unworldly, irrespective of career? Exactly. Employment opportunities are–and this has always been the case, but it is accelerating– often filled based not on objective meritocratic criteria but on the social connections the prospective employees possess and factors like looks and conformity to unwritten but well understood social norms. It’s like expecting to be admitted to a sorority based on talent or grades–that’s just not the way it works. People are tribal. The economic damage wrought by such non-meritocratic criteria being so weighted must be astronomical. How does one address this though? It seems inherent in human nature. Aggressive use of testers to root out employment discrimination based on the so-called non-meritocratic criteria. But I’m not expecting anything of a sort in the near future, particularly from a house servant like the President. i would hire you in a second if I could … I am meritocratic that way ;-) Good news: you have to be able to go anywhere and travel light, meaning literally anywhere, like boomtown N Dakota … and travel light as in, don’t have a family or pets or at least leave them behind like Mexican crop-pickers do when they travel north of the Rio Grande. Bad news: merit is increasingly limited not just to who you know, but being a relative of someone who has a job already … most jobs are never posted. Social Darwinism not only destroys the free market in goods, but also in services … your employment being a service. Good luck with that, you will need it. Housing is one of the reasons I believe that a $9 minimum is too low. Using the guideline of 25% -30% of your pay on housing means that a minimum wage earner is supposed to find housing for under $400. How exactly does anyone do that anywhere? I think because it’s kind of an unspoken rule of the land that a minimum wage earner is supposed to have as many roommates as possible. Then again, there are some who don’t even get the minimum. When I lived in CA (Santa Rosa/Sonoma County), the Mexican grape pickers next door had 11 in their $750/mo shanty box, a place that was the same size as my absurdly tiny studio. dumped in favor of the Global Standard). …for instance, even 11 people in a shack — in wine country — looks a whole lot better than the global average. Yeah, I recognize that. There’s definitely worse out there. And actually those grape pickers seemed to be having a fun time, albeit a Budweiser-fueled one sans female company. The more we pack this planet full of people and the more some small very rich contingent keeps taking all the land for themselves with no limitations, the worse this sort of thing will get. Maybe the target will be more like central Africa and India someday will be seen as comparatively extravagant. I remember the argument to this used to be “just build into the sky,” e.g. high rise apartment buildings would displace the problem of owned 2-D surface area in housing with an expanding population by adding the further dimension of height. Now I don’t even hear this argument. It’s more like “f— ’em. Their fault if they don’t have anything.” Similarly, I remember in the Cold War days the argument against socialism/communism was “what incentive is there to do better if you’re not compensated?” But now that globalization is showing that even in ostensibly capitalist/market societies there is nothing but downward wages and living standards for most, that argument has disappeared into the aether too. Funny how that happens. Rather than the minimum wage being to low, perhaps the price of the assets, and all related prices, are too high? Assets that have been bid up with fiat and credit creation? Would it make sense then to increase the minimum wage, with all the attendant follow on effects? Which would likely push rents and asset prices higher? Which would generate more fiat and credit creation? The problem I have personally with your stance Danny is, yes, more government interventions, more regulations and better enforcement of existing regulations, more taxation, more critical thinking about what exactly big business is up to etc. etc. etc. *may well8 introduce problems of its own. But can it really be any worse than how things are at the moment ? And who says it has to be forever ? How’s about we try a little more big government mixed with a popular movement to hold said government to account and see what happens ? If it’s worse, we can always change it back again can’t we ? Again, just my take, I’ve seen awful service and abysmal behaviour from government along with corruption, gerrymandering and plain simple incompetence. I’ve also seen excellent standards and a genuine public service ethos. Conversely, I’ve never encountered a single big corporation that, eventually, didn’t want to bleed my dry if it could possibly get away with it. So I’d take big government over the current experiment in corporatism any day. And I’d much rather live in France, Germany, Japan or Switzerland than the US. Erm, how about Spain? Italy? If you were Muslim or North African, and lived in France, I’m not sure you would prefer it. Portugal? Russia? Greece? I agree with you about this iteration of corporatism, a soulless demon that infects every nation. I much prefer the old corporatism with the owner figure at the head of that corporation. At least there was a face to to put to evil deeds. At least the buck stopped with them, rather than some unaccountable board or TBTJ CEO. Also, with the horsemeat scandal and all the other banking crap going on in Europe, who is to say that corporatism has not taken root there in a slightly different form? I don’t think you’re going to find too many fans of QE around here. Keynesian spending perhaps, but aficionados of QE are a rarity in these parts. That’s the kind of “freedom” you neoliberals cherish. From Danny’s perspective (and capacity) you might as well be speaking in tongues. Funny, but “right to work” and “employee at will” often do NOT go both ways. In many professions and industries there are non-compete agreements that preclude the ability for the employee to immediately and easily go out and maximize his/her true “market value” with another employer. Bottom line is the employers want to be able to control everything and make all the rules so that they are in their favor all the time. When will employees figure this out? The point of having power over others, is to that it is easier to take advantage of them, so that the “king of the hill” game might continue. It all comes down to the Seven Deadly Sins, leading with Pride. Shall we have some sympathy for the average person in denial of this, and their modest place way down the hill, that they resort to alcohol, tobacco and denial as self medication and self counseling? They can’t afford prescription drugs and professional counseling. But we can promote a different game than “king of the hill”. I don’t read posts about how we can make “king of the hill” more efficient. 3)the highlight for me is this quote “even a skilled employee needs to learn the quirks of how his employer likes things done” hilarious. The barely between the lines implications are infantile. You’re a cretin. I am glad I only needed one visit to this site to know I’ll never do it again. Thank you for commenting. Your comment is very important to us. Please do not hesitate to comment again. Sadky, this won’t be happening unless the “threat” to not visit again was idle. sadly. I don’t know what sadky is. It is also very appropriate considering Gene, the cretin troll, and his so-called comment. I just skimmed the entire pdf and nowhere was I able to find any discussion (let alone “in-depth”) of a change in jobs by the choice of the employee. Not to mention “the discussion of the role and efficacy of a college education within this analysis really (tying) things together.” Huh???? This guy can’t even read. I’m actually more than just a little surprised he was able to find this site in the first place. There was another version of this answer that showed up on a Hullabaloo thread some years ago, before Hullabaloo went all Veal Pen. It read . . . ” Thank you for your interest in my comment. I am always happy to hear from you. Then why are big banks seemingly the only employers willing to pay their employees big salaries and bonuses? Why? Probably because it’s not their money. It’s only some of their employees. And the other companies are also paying a minority of their “employees” big bucks too. Nonsense, you are talking about part of the owner class who are “employees” in only the thinnest of definitions needed to maintain a legal relationship with the firm. They are anything but employees. They are the owners as their stock options will attest to in any context where words have meaning. Actual bank employees are paid crap. There have been highly skilled commercial pilots on the street for ten years. They have been able to pick up work waiting for the majors to bring them back, but now the smaller companies have gone out of business. We need more commercial pilots, but many are home with families not using their skills. My son was offered a job training pilots in China, but was told when they were ready, his job was over. Time for some respect for the US labor market. Time for corporations to bring jobs back and pay for some training or arrange it through US systems instead of using off-shore labor and products tax-free for corporate profits. Watch the immigration bill because they like to train IT workers off-shore at foreign countries’ expense and bring them in on special visas. US citizens first. It would take cancellation/abrogation of all the Free Trade Agreements and Laws to allow that to happen. Certainly the repeal/abrogation/withdrawal-from of NAFTA, WTO, MFN for China. Maybe cancellation of all such agreements going all the way back to GATT 1. This is extremely likely to happen. History tells us that a major political/economic failure during a “free trade” period means that the post-revolutionary / post-reform governments abolish the free trade agreements. This is maybe a different conversation, but a big part of the reason why there is such a surplus of commercial pilots is because of the huge war machine that we have developed. The Air Force and Navy (mostly) churn out trained pilots in considerable excess of what we would need just for the actual defense of the nation. Then we let them go and release them to the civilian labor market, in numbers far in excess of what the airline industry needs. This is only one small piece of the aggregate picture, yet that picture is built up by a lot of little pieces like this. Another piece was that United Board hired Glenn Tilden from the oil industry to reduce the size of the company preparing it for merger, take the pension money and pay himself and his friends much money. When the pensions disappeared, the union went to Congress to raise the age for pilots from 60 to 65 rather than toss the older pilots on the street with nothing. This caused the younger pilots to be furloughed. The problem now is the companies who took in those younger pilots for temp work are almost gone. The days of pie-in-the-sky degrees should be over. This has been going on since the boomers hit college and nobody was willing to address it back then either. It is a failure of society to meet the needs of its population in a timely and significant manner. It is a failure of social policy. Instead we went for the cheap and dirty “free market” solution. I think the discussion here is too narrowly focussed on the ‘good of the company’ or the ‘good of the individual worker’, without regard to the larger social and economic implications– particularly the social contract between worker and employer, and in a larger sense, the social contract between corporation and nation-state. This last has been famously swept under the rug by the mantra ‘Our responsibility is to our shareholders,’ which neglects the degree to which corporate success depends upon federally maintained infrastructure — physical as in roads and bridges, but also legal, as in the ability to enforce contracts– not to mention an educated workforce, a functioning healthcare system, a stable currency, etc. etc. All of these, sooner or later, are undermined by the relentless corporate focus on the bottom line; and the logical conclusion is the corporations become self-destroying, inasmuch as they poison their own nest. No one looks this far ahead these days, at least, no one in a position of power. The concept of disposable workers is, to my mind, just one highly visible symptom of the larger destruction of the post-WW II social contract in America, which began in the Reagan presidency, but which has continued apace ever since, the seeming respite of the Clinton years notwithstanding. Indeed. It strikes me a little like proving that torture is bad because it doesn’t work. True, it doesn’t work very well or very consistently, but that is not the principal reason it is bad. Still, the article is excellent and like the torture argument, very much needs to be made. Well, yeah. I think it’s an important point to make, however. It’s one I’ve been ranting about for years now. We have elites who are doing things which are not only bad for everyone *else*, but also not in their *own* long-term interests. This is unsustainable and will have to change, though I’m not exactly sure how. My best guess is indeed that smarter would-be elites — elites who are *loyal* to their vassals — will overthrow the existing elites. Corporations are self destructive, the only question is the timeline. Between inefficiencies of size and entropy, all men and all man made things decay. Capitalism is monetary/credit diabetes. Consider the eventual failure of the East Indies Company during the Great Indian Mutiny … the government had to come in to clean up and nationalize, thus Queen Victoria became Empress of India. You know, it is not only the low pay and lack of benefits for the hourly worker at the bottom that makes their job stink. With “flexible” schedules and employer designed worker churn, the jobs are quite isolating. Can you really forge any relationships? And are you even allowed to do your job well with nonexistent training and chronic understaffing? Or training that is so very sketchy but barely passablethat one is forced to face scowls or questions from upper echelon when the question is raised about training. ‘We went over that already.’ Also, realize in many job positions, the lack of quality in servicing customers or in maintaining quality of manufacturing, the philosophy is to ‘pick up the slack on the back end.’ Sometimes the returning shoddy products is fully the expectation by upper level management for a brand name that can’t seem to get it together on the quality side-just offer dissatisfied customers easy returns for a new product or money off via a store credit for bad customer service. This is a chronic problem I found infuriating when trapped in the low-wage service gulag. Little or no training provided, no-one gives a crap about helping you learn stuff, yet I’m supposed to read their minds as to how to do every procedure. C’mon, NC is the smartest crowd I know, so why are well all hooked on the jobs imperative? Fact is, there is plenty we have, little of which we need. Confiscatory tax rates at the high margins, and over large estates, could resolve the problem of individual incentives over public goods, and wouldn’t require the level of intrusive “big gov’t” regulation over every business transaction that so many fear (not that some transactions with physical externalities, such as pollution, shouldn’t remain regulated). This is true. The vast majority of what is at the root of all this is simply untenable and widening wealth/income/power asymmetries. You fix that and most of not just this but most else of what is currently wrong with the US will “magically” resolve itself. Addressing anything short of this root cause is futile, like treating only the symptoms of a disease which there is a known cure for. Bingo. But how do we fix the unsustainable wealth and power disparities? We then have a *political* question. We’ve already discussed the corruption and the defects of our electoral system, but beyond that, the fundamental key to politics is “winning hearts and minds”, and so then we have a *media* question. The media question has to be resolved first. Then the political question can be resolved. At that point it becomes possible to resolve the economic problem. They are all stealing from you, Danny. Every last free-be sucking one of them! Every minute, every day. And don’t let anyone on this site tell you different. An entire generation has been hoodwinked by the Reagan Era philosophy that the “market” could be trusted to keep corporations and labor in line with just enough competition and regulation. Well, the only thing that trickles down in that environment is the piss on our heads by corporatists who also control government. We all thought O was the populist everyman — HAR HAR HAR that would change the way multi nationals used 7 billion of us against each other in competition for jobs – while they are free to sell across borders. Obama taught us something…. DO NOT BUY INTO POPULISM JUST BECAUSE IT’S PACKAGED IN BLACK FACE. O is a lawn jockey for Wall St and the international elite. We must not fall for this again. If Corporations were not allowed to sell goods in this country if said merchandise was made with slave labor elsewhere. Ditto for products made with no environmental regs… and dumped here after trashing the country of origin. It’s about Progressive’s retaking the Democratic Party. We need REAL choices… between Obomney and a Ralph Nader or Denis Kucinich. A Nader presidency and congress would have tariffs on goods made overseas….If you make it there.. sell it there philosophy would bring the jobs home. Levi’s are now made in villages in Mexico for pennies, while they turn all the rivers and creeks blue.. destroying agriculture for miles in every direction. The jeans are still a hundred bucks a pop… and there’s just more for management and stockholders. Mexicans get nothing, the pollution is horrific… and Americans pay the same amount. Governments are supposed to take care of their populations. That means the US government is protector for AMERICANS … not corporations. If companies want access to this market… then the goods should be made here — END OF DISCUSSION!! OR pay the import duties. We’ve been sold on the idea of free trade being good for everybody… it’s good for NOBODY. The Fourth Estate’s obfuscation of the realty is bad enough, but then one even finds that a seeming majority of those community, county, national etcetera “non-profit” organizations presumably serving those falling through the cracks and committing suicide (more detailed pdf file) in record numbers (noted in stifled from the’ press’ reports (the full report pdf file), which have more and more been pointing to the economy, versus ‘mental illness,’ are littered with: with CEOs and Boards of Directors predominantly consisting of Bankers and other assorted Rentiers Representatives; and Multinational Corporate Affiliates, whose contributions are less than chump change considering that they’re in large part responsible for the misery, and in comparison to their trillions of Now Legalized Offshore Tax Savings. No small wonder one rarely, if ever, sees a front page editorial by one of these organizations slamming the powers that be who are running millions into the ground, and then some. It is rather intractable, isn’t it? I think the US simply needs to live with a structurally disposable labor force, otherwise it may end up like Germany. Because Germany invests in its labor force, a comparatively stable, highly-skilled labor force producing high quality goods is the result. These goods are competitive and desirable on international markets, thus Germany is an export powerhouse. Unfortunately, it gets vilified for not consuming vast amounts of, or vastly overpriced, inferior goods in return. Should it decide instead to consume these quality goods at home to avoid trade imbalances, it will get vilified for not sharing, exporting, and providing vendor financing. Being competent at what you do may simply turn you into a type of serf of the less competent. In the presence of free trade, there does not seem to be an alternative to a mediocre and disposable labor force, or is there? In the absence of free trade, the MMT JG could work, but I don’t see how the JG could avoid the mediocrity part to ensure continued improvements in living standards. The Anglo neo-liberal propaganda machine (e.g. NYT) will vilify any country that does not agree with their brain dead ideological norms. Equador being the hate du jour. Yves, they are trying to turn everyone into a small business. The worker now gets to ride the ups and downs of the small business owner; the uncertainty of income; the marginal tax benefits. The flip side of this: if the “conventional wisdom” of most employers is to systematically undervalue an asset – in this case, human capital – then that should open up wonderful opportunities for entrepreneurs smart enough to see the opportunity and to make the most of it. Those that have the ability to assemble a nimble team of high potential but undervalued (and available) people should become capable of running rings around the old, poorly staffed corporate dinosaurs, and eventually displacing them as the dinosaurs shuffle off to their well-deserved extinction. You really want the answer? Illegally, is the answer. There are any number of ways once the law is ignored. And yet we continue to accept the “we’re not going to hire someone who doesn’t already have a job” policies that so many companies have, that by their very nature only reward disloyalty. But that’s a feature, not a bug: if you’re careful to only select people who are likely to leave you in a couple years, you never have to worry about pensions or the raises that you only award based on seniority, not production.